Back in 1992, I helped put a school voucher initiative on the ballot in California. It was a campaign that would change my life. I learned a great deal about the issue of school choice, but I also learned a great deal about people. When trying to gather support for school choice, I met many natural supporters of school choice who taught me the lesson of my life–they shared, “for us to trust you, we need to see you show you care.” They asked me where were you when my wife died, when I built this school, when my daughter had her first baby,” and so on. Their point? If we care about the communities we seek to serve, we must invest time in developing real relationships. I love that message and have tried to live out the lesson ever since. That’s why it is so exciting to share with you two pieces of great news. Last week, I was in Portland, Oregon, speaking to a school choice group. They wanted to know the power of school choice. I was able to share with them the reality of the power of school choice by introducing them to Jeremiah Tate, a 2012 graduate from one of GEO’s schools. Jeremiah now lives in Portland working for Intel as an engineer. He graduated from our school in Indianapolis in 2012 with more than 30 college credits and went to Rose Hulman at the age of 16 on a scholarship. He graduated with his Bachelor’s degree in engineering at the age of 20 and has now been at Intel for two full years having the time of his life. I’ve known Jeremiah since he started attending our school. I was at his high school graduation and shared in his joy when he graduate from Rose Hulman and moved to Portland and got his first apartment. We remain good friends today. If our school didn’t exist, he would have been condemned to a failing school in the troubled neighborhood we served. We wouldn’t know each other. Thankfully, he had a choice. So imagine how proud I was listening to him speak to the group in Portland. You can watch his five minute speech by clicking on this link–video. Then late last week, the National Public Charter Schools Association invited another one of GEO’s graduates to speak to their entire national conference audience in June. Raven Osborne, pictured above, is a 2017 graduate from our Gary school. 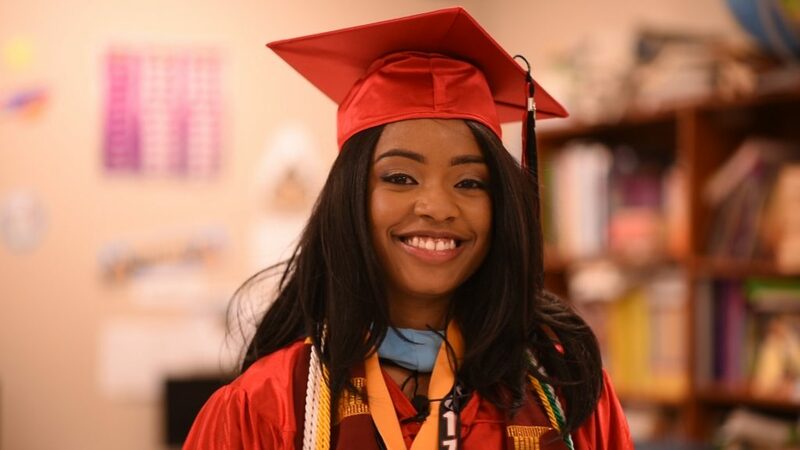 She earned her Bachelor’s degree BEFORE earning her high school diploma. You may have heard about her. I was there when she started her journey toward earning her bachelor degree and shared in her joy when she shared her semester college grades each time. Very cool! In any case, the national association is featuring Raven along with two other charter school students to impress upon the national audience the power of school choice and charters. It is so exciting to see the growing number of success stories we can share with our friends. Even more exciting is that I actually know these students and we have a rich relationships. They are a key part of my growing family. We will have a family of more than 2500 this August. How about that? Think of the potential for many more success stories for years to come. Wow!